Elections are a few weeks away. The burning issue is jobs. More specifically, the lack of jobs. I have a solution for creating new jobs. The solution is no rocket science. Sheer common sense. And to attract the elected new government…it involves no capital investment. Jobs are a source of income. Jobs focus on tasks. Tasks are repetitive, with a focus on operations and quality control. Over time, jobs get boring. On the other hand, employment is satisfying. Employment focus is on operations and quality improvement. Employment is a source of purpose and dignity for individuals. 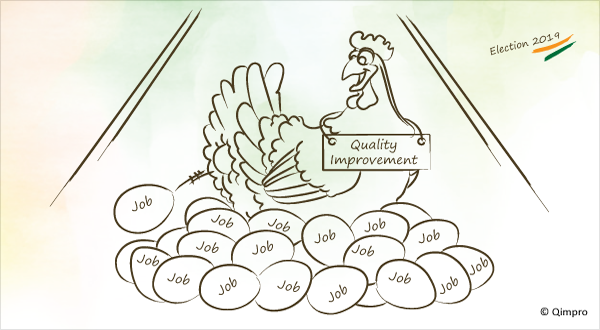 I recommend that job designs should go beyond quality control, to incorporate quality improvement. In quality control we maintain the standard. In quality improvement we challenge the standard. So what is this blog about? It’s about generating employment in existing jobs, as well as in new jobs. The by-product of quality improvement is a reduction in cost of poor quality (COPQ). COPQ in any organization ranges between 20% and 40% of total costs. Any reduction in COPQ goes straight to the bottom-line, without capital investment. Therefore, quality improvement is a mega profit centre. With a significant increase in profit, organizations can expand or diversify, thereby creating new jobs and/or employment across their supply chain. To address the national crisis for jobs, we sometimes get handouts from the government. Getting a government handout may not necessarily meet the receiver’s sense of grace and honour. Do you agree? Do you have a system to estimate your COPQ? If not, you have legitimized chronic waste! Great thoughts Mr Lulla! Also, the other area to be considered is the disparity in remuneration where top management gets paid disproportionately higher than middle and junior management. This is nothing but an insult to the hard work put in by the front line employees who are doing the “real” work. We have just focused on the “leader” or “manager” for long with tepid long term results. It is time now to focus on the worker and process.